What's inside? Look at the case. Stop by Friday, and I'll show everyone. Hmm. That kind of lock reminds me of Zeiss, German at any rate. 1960s or 70s. I'd bet it is not binoculars. Something like Delloflex reads in the bottom right. Dimensions of this? Looks like some kind of folded device. Let's wait until Friday. A Rolleiflex of some kind? 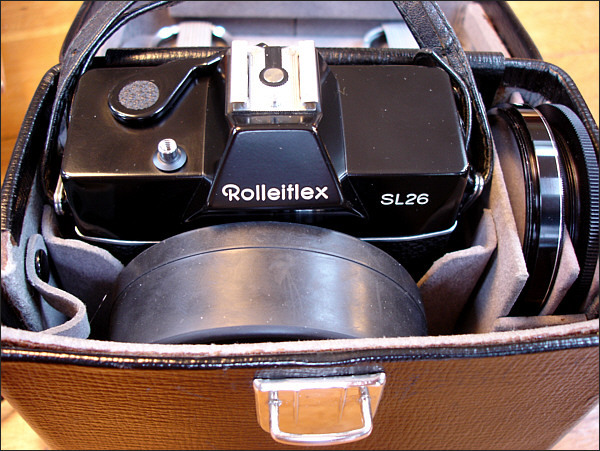 It *does* say Rolleiflex on the box. . . Suspicions sneak up on me. That box sure looks clean and little used. 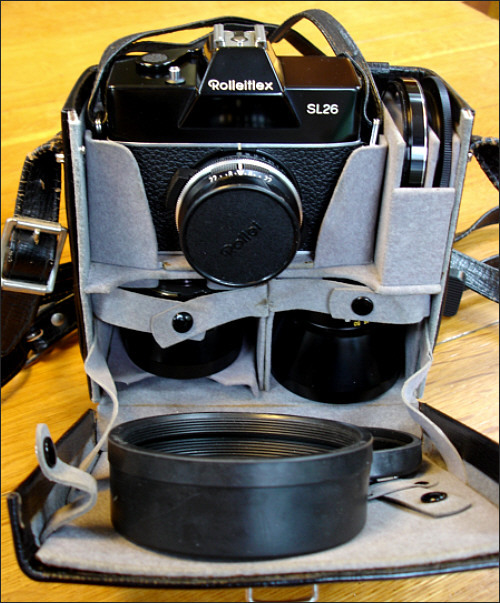 The case does, in fact, say Rolleiflex. The case was in good condition, considering its age. I did my usual work, which was to clean the case with saddle soap and then apply a fresh layer of black shoe polish and buff to a nice sheen. Some scoff at this method, but it's leather. 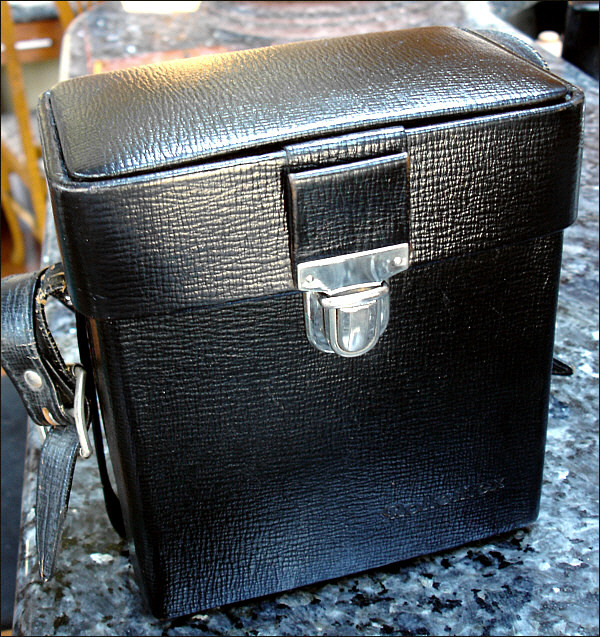 If shoe polish works for shoes, it will work for camera coverings and bags. Leather is leather. The chrome fittings were heavily oxidized, but some Flitz brought them back. 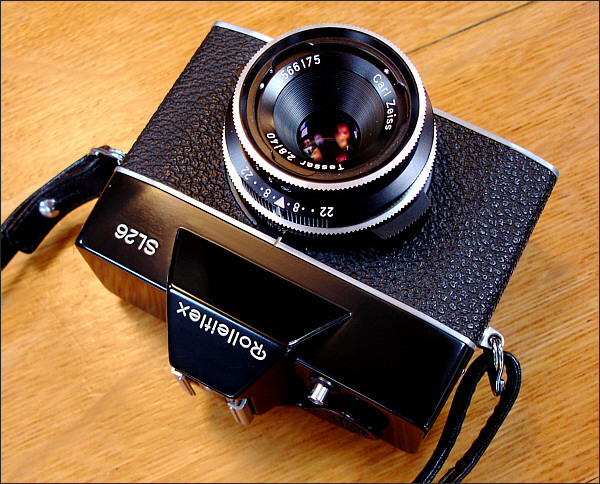 It's a Rolleiflex SL26, which uses 126 Instamatic film. It's a complete SL26 kit in the deluxe padded case. 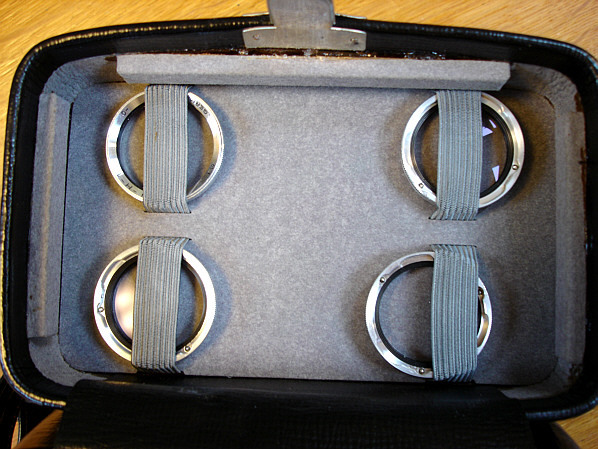 The top of the case holds a UV filter and three Bay 1 Rolleinars 1-2-3 (obviously, no Rolleipars needed). I've used one of these before, and they're nice cameras. 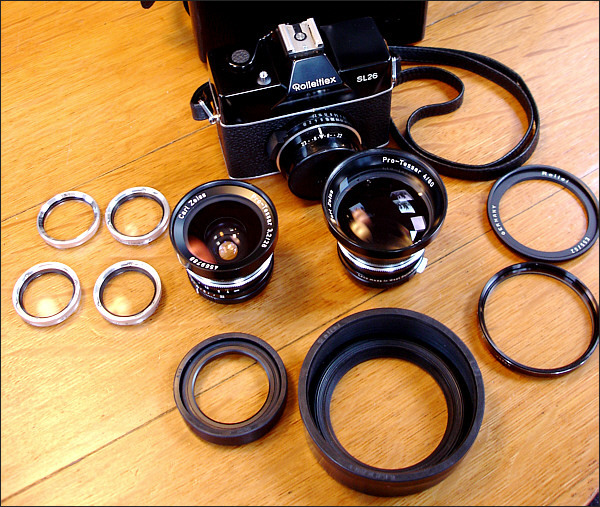 The downside: The loose tolerance of the 126 cartridge and now the limited availability of the film. I'm hoping that Lomography finds a way to revive the format. I still have about six or seven unused cartridges available. By the way, the camera is in good working condition. I plan to pop some film into it soon. Maybe a good candidate for Film Day. Wooooow!! What a nice kit. And in great condition too. From the first picture of the case it was hard to tell the real dimensions of it, but I expected an A100 or an A26 to be inside. I didn't think about this model, which is very cool with those extra lenses. Oooo, as a fan of 126, I'm in awe. I have the Kodak Instamatic slr but the Rollei one is definitely another step up! Congratulations. Very impressive kit! and good mystery to think about. Have you tried reloading 126 cassettes yet? Are the lenses interchangeable, or are they just auxiliary lenses shown?